Read here how to post costs and working hours in InLoox PM 8. The system assigns the effort to the project plan automatically and stores a separate cost record. Open an existing project with an existing planning. For more information on how to create a planning, see Create planning elements. In the project, on the Start tab, in the Section group, click Time Tracking. On the Time Tracking page, in the Common group, click New. In the Date and Duration area select the Start and End date time. Choose between Duration and End date time by clicking on one of them in the Date and Duration area and choose the other opportunity in the drop-down list. In the Description field enter a text, e.g. the location of the service, the team member name, the meeting results or internal remarks. InLoox PM provides you with different formatting features for the Description field text. For more information about these features see Create and change comments, in the Customize a comment section. Define wwhether you want ot assign to a work package or to a planning element. Click Work package button and select Work packages or Activitiesfrom the drop-down list. 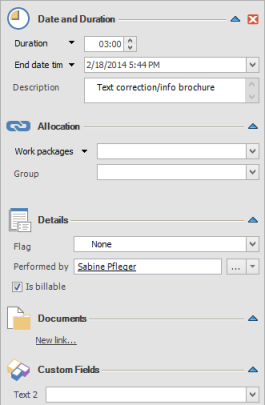 For the Work packages option select one work package between assigned or not in the next field to the button. For the Activity option select the certain element by the name from the planning list in the next to field the button. Select a group in the Group filed to which this entry belongs. Choose from the Flag drop-down list a color to mark the item in the time tracking overview. In the Performed by box choose a name of the person, who carried out the item. Click beside Performed by and choose a name from the Select contact dialog box. InLoox PM saves automatically the name of the person, who created the item or last edited it. Use the quick selection to add a new resource. Click the Arrow to see all resources in the drop-down list all resources, which have been added to the project. Select the Is billable control box to bill this item on the Budget page. The items with this status are included in the actual revenues of the project budget. The added document is displayed in the Document area on the side panel. Click it to open this document. Click Delete symbol to remove it. Click in the previously created custom field and enter a new value. For more information on how to add a new custom field in InLoox PM, see Create custom fields. How to create and edit time tracking entries | InLoox PM 8 • Copyright 1999-2019 © InLoox, Inc. All rights reserved.